Links to Hildegard Related Resources - Scroll down to find a more thorough Bibliography. For specifically academic bibliographic (critical editions, peer review, presentations et al.) sources and discussion, visit the Academic Sources tab. Early Christian Writings Online - Gnostics et al. IntraText - Online Latin, German, Philosophy et al. Barbara Newman, “Romancing the Past: A Critical Look at Matthew Fox and the Medieval Creation Mystics,” Touchstone 5 (1992), pp. 5 - 10. Dronke, Peter. "Hildegard von Bingen." In Women Writers of the Middles Ages: A Critical Study of Texts fro Perpetua to Marguerite Porete. Cambridge University Press. 1984. Flanigan, Sabina. Hildegard of Bingen: A Visionary Life. London: Routledge, 1989; reprint, New York: Routledge, 1993. Silvas, Anna. Jutta and Hildegard: The Biograhpical Sources. Penn State University Press / Brepols. 1999. Kerby-Fulton, Kathryn. “Prophet and Reformer.” In Voice of the LivingLight: Hildegard of Bingen and Her World, ed. Barbara Newman, 70-90. Berkeley: University of California Press, 1998. Maddocks, Fiona. Hildegard ofBingen: A Woman of Her Age. London : Headline Book Publishing, 2001; reprint, Image Books, 2003. Witts, Richard. “How to Make aSaint: On Interpreting Hildegard of Bingen,” Early Music 27.3 (1998) : 478-486. 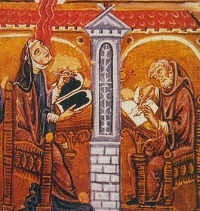 Hildegard von Bingen. Hildegard von Bingen's Physica: The Complete English Translation of Her Classic Work on Health and Healing. trans. Priscilla Throop. Healing Arts Press. 1998. Strehlow, Wighard and Hertzka, Gottfried. Hildegard of Bingen's Medicine (Folk Wisdom Series). Bear & Co. 1987. Hildegard of Bingen. The Letters of Hildegard of Bingen: Volume I. New York: Oxford University Press, 1998. Hildegard of Bingen. The Letters of Hildegard of Bingen: Volume II. New York: Oxford University Press, 1998. Hildegard of Bingen. The Letters of Hildegard of Bingen: Volume III. New York: Oxford University Press, 2004. Van Engen, John. "Letters and the Public Persona of Hildegard of Bingen." In Hildegard von Bingen in Ihrem historischen Umfeld, ed. Alfred Haverkamp, 375-418. Mainz, 2000. Highley, Sarah L. Hildegard of Bingen's Unknown Language. An Edition Translation and Discussion. Palgrave Macmillan. 2007. Jennifer Bain. Selected Antiphons of Hildegard von Bingen: Notational and Structural Design. M.A. Thesis. McGill University: Montreal. 1995. Fassler, Margot. “Composer and Dramatist: Melodious Singing and the Freshness of Remorse.” In Voice of the Living Light: Hildegard of Bingen and Her World, ed. Barbara Newman, 149-175. Berkeley: University of California Press, 1998. Fassler, Margot. “Music for the Love Feast: Hildegard of Bingen and the Song of Songs.” In Women’s Voices across Musical Worlds, ed. Jane A Bernstein, 92-117. Boston: Northeastern University Press, 2003. Saint Hildegard of Bingen. Symphonia: a Critical Edition of the Symphonia Armonie Celestium Revelationum [symphony of the Harmony of Celestial Revelations]. ed. and trans. Barbara Newman. 2nd ed. Ithaca, NY: Cornell University Press, 1998. Hildegard of Bingen. Symphonia vol. 3 : The Holy Spirit. Edited by Marianne Richert Pfau with translations by Barbara Newman. Bryn Mawr: Hildegard Publishing Company, 1997. Jeffreys, Catherine M. “Melodia et rhetorica: the devotional song repertory of Hildegard of Bingen.” Ph.D. diss., University of Melbourne, 2000. Jenni, D. Martin. “Echoes in Hildegard’s Songs of the Song of Songs,” Mystics Quarterly 17 (1991) : 71-78. Lomer, Beverly R. Music, rhetoric and the creation of feminist consciousness in the Marian songs of Hildegard of Bingen (1098--1179. PhD Dissertation. Florida Atlantic University 2006. McGuire, K. Christian. Symphonia Caritatis: The Cistercian Chants of Hildegard von Bingen. presentation at International Congress on Medieval Studies, 2008. McGuire,K. Christian. Symphonia Caritatis: The Cistercian Chants of Hildegard von Bingen. M.A. Thesis. University of Minnesota 2007. Pfau, Marianne Richert. “Hildegard von Bingen’s Symphonia: An Analysis of Musical Process, Modality, and Text-Music Relations.” Ph.D Diss., Stony Brook University, 1990. Stevens, John. “The Musical Individuality of Hildegard’s Songs: A Liturgical Shadowland.” In Hildegard of Bingen: The Context of Her Life and Thought, ed. Charles Burnett and Peter Dronke, 163-188. London: Warburg Institute 1998. McGinn, Bernard. “The Changing Shape of Late Medieval Mysticism,” Church History, Vol. 65, No.2 (Jun 1996), 197-219. McGinn, Bernard. “Love, Knowledge, and Mystical Union in Western Christianity: Twelfth through Sixteenth Centuries,” Church History, Vol. 56, No.1 (March 1987) : 7-24. Butcher, Carmen Acevendo. Hildegard of Bingen: A Spiritual Reader. Paraclete Press. 2007. Mews, Constant J. “Hildegard and the Schools.” In Hildegard of Bingen andthe Context of her Thought and Art, eds. Charles Burnett and Peter Dronke. 89-110. London: Warburg Institute, 1998. Mews, Constant J. Process Thought, Hildegard Of Bingen And Theological Tradition. Available at http://concrescence.org/ajpt_papers/vol01/01_mews.htm. Internet. Accessed 2007, March 30. Mews, Constant J. “Religious Thinker: ‘A Frail Human Being’ on Fiery Life.” In Voice of the Living Light: Hildegard of Bingen and Her World. ed. Barbara Newman, 52-69. Berkeley : University of California Press, 1998. Newman, Barbara, Sister of Wisdom: St. Hildegard’s Theologyof the Feminine. Berkeley: University of California Press, 1987; reprint 1989. Somfai, Anna. “Hildegard of Bingen: The Power of Vision and the Vision of Power.” In Issues in Medieval Philosophy ed. Nancy van Deusen. Ottawa : The Institute of Medieval Music, 2001. Tsakiropoulou-Summers, Tatiana. “Hildegard of Bingen: Teutonic Prophetess.” In WomenWriting Latin: From Roman Antiquity to Early Modern Europe vol. 2. eds. Laurie J. Churchill, Phyllis R. Brown and Jane E. Jeffrey, 133-172. New York, 2002. Hildegard of Bingen: Scivias. trans. Mother Columba Hart and Jane Bishop. Paulist Press 1990. Hildegard of Bingen. Scivias by Hildegard of Bingen: The English Translation from the Critical Latin Edition. trans. Bruce Hozeski. Bear & Co. 1985. Hildegard of Bingen. The Book of the Rewards of Life: Liber Vitae Meritorum. trans. Bruce W. Hozeski. Oxford University Press. 1997. Dyrek, G.M. The Seer and the Scribe: Spear of Destiny. Luminis Books. 2011. Kampås, Ingrid. Drottningkronan: Slakten del 5. Historiska Media. 2013. Lachman, Barbara. The Journal of Hildegard of Bingen: Bell Tower. Harmony. 1995. O'Hanneson, Joan. Scarlet Music: A Life of Hildegard von Bingen (Crossroad Fiction Program). Crossroad Publishing Company. 1997. Hildegard of Bingen. In Our Time. BBC Radio 4. June 26, 2014. Hildegard of Bingen: Sybil of the Rhine. Harmonia. Indiana Public Radio. Program (01-11) 2002.